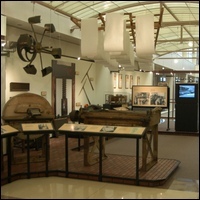 This museum is an internationally renowned resource on the history of paper and paper technology. In addition to more than 2,000 books, the museum features a remarkable collection of more than 10,000 watermarks, papers, tools, machines and manuscripts. It is a fine venue for paper-related exhibits, with a focus on book arts, history, photography, print and the art of handmade paper. Parking: As you continue on 10th Street, cross Hemphill Avenue and the parking entrance to the museum's main location will be immediately on your left. MARTA: Take MARTA to the Midtown Station. Out of the station walk west on Peachtree Place. Turn right at West Peachtree Street and left on 10th Street. Walk about 0.9 mile on 10th Street to reach the museum.